Algeciras (; [alxeˈθiɾas]; Arabic: Al Jazīra Al-Khadrā الجزيرة الخضراء‎‎) is a port city in the south of Spain, and is the largest city on the Bay of Gibraltar (in Spanish, the Bahía de Algeciras). The Port of Algeciras is one of the largest ports in Europe and the world in three categories: container, cargo and transhipment. It is situated 20 km north-east of Tarifa on the Río de la Miel, which is the southernmost river of the Iberian peninsula and continental Europe. In 2015, it had a population of 118,920. It enjoyed a brief period of independence as a taifa state from 1035–1058. 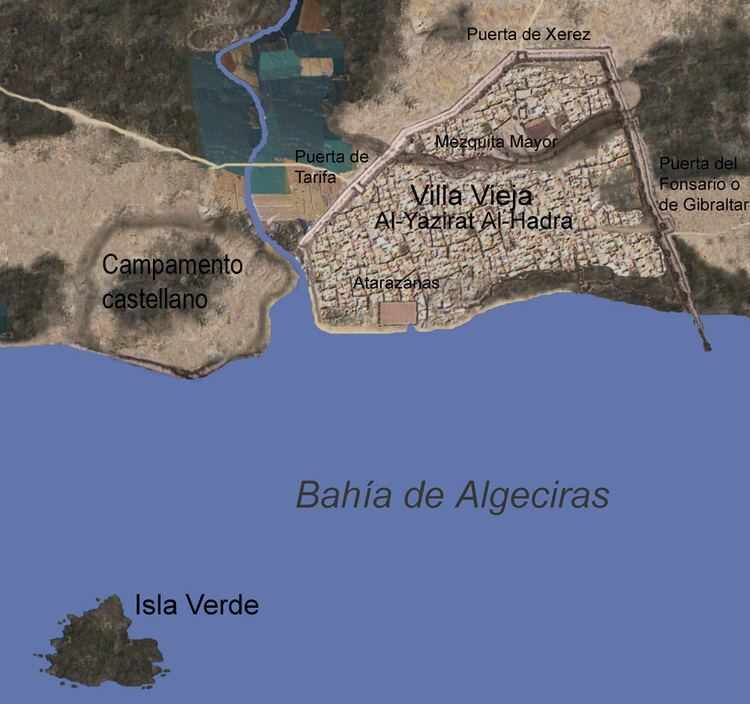 It was named al-Jazirah al-Khadra' ("Green Island") after the offshore Isla Verde; the modern name is derived from this original Arabic name (compare also Algiers and Al Jazeera). The city was retaken by the Moors in 1368. It was destroyed on the orders of Muhammed V of Granada. The site was subsequently abandoned, but was refounded in 1704 by refugees from Gibraltar following the territory's capture by Anglo-Dutch forces in the War of the Spanish Succession. It was fortified to guard against British raids with installations such as the Fuerte de Isla Verde built to guard key points. 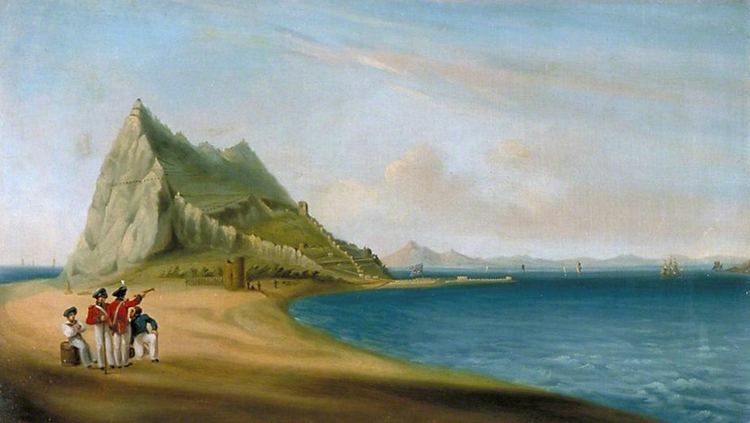 Algeciras was refounded in 1704 by refugees from Gibraltar following the territory's capture by Anglo-Dutch forces in the War of the Spanish Succession and rebuilt on its present rectangular plan by Charles III of Spain in 1760. In July 1801, the French and Spanish navies fought the British Royal Navy offshore in the Battle of Algeciras, which ended in a British victory. Algeciras is principally a transport hub and industrial city. 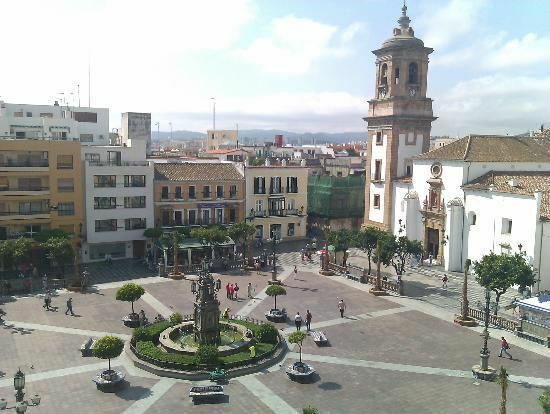 Its principal activities are connected with the port, which serves as the main embarkation point between Spain and Tangier and other ports in Morocco as well as the Canary Islands and the Spanish enclaves of Ceuta and Melilla. It is ranked as the 16th busiest port in the world. The city also has a substantial fishing industry and exports a range of agricultural products from the surrounding area, including cereals, tobacco and farm animals. Gibraltar Airport - to 20 km. Jerez Airport - to 100 km. Málaga Airport - to 120 km. Algeciras CF, founded in 1912, played in the third-tier Segunda División B in 2013-14 season and relegated to Tercera Division, fourth level of Spanish league after losing play-out, holding home games at the Estadio Nuevo Mirador.